1. George H.W. Bush: emblematic of "a truly vanished world"
The passing last night of President George H.W. Bush at age 94 "marks the end of a long era in presidential history — what we might call the Cold War Presidents: Truman, Ike, JFK, LBJ, Nixon, Ford, Carter, Reagan and Bush," presidential historian Jon Meacham, author of "Destiny and Power: The American Odyssey of George Herbert Walker Bush," tells Axios. The big picture: "The last combat veteran to hold the office, President Bush came from a truly vanished world. Born to privilege, he had the most adventurous and courageous of spirits (he considered joining the Royal Air Force after Pearl Harbor since the RAF would take 17-year-olds). ... "The war years, the move to Texas, the long apprenticeship in national politics and governance — it was a thrilling life, and he loved every bit of it." The N.Y. Times' Adam Nagourney writes for history: "George Bush, the 41st president of the United States and the father of the 43rd, who steered the nation through a tumultuous period in world affairs but was denied a second term after support for his presidency collapsed under the weight of an economic downturn and his seeming inattention to domestic affairs, died on Friday night at his home in Houston. He was 94." "Through his essential authenticity, disarming wit, and unwavering commitment to faith, family, and country, President Bush inspired generations of his fellow Americans to public service — to be, in his words, 'a thousand points of light' illuminating the greatness, hope, and opportunity of America to the world." 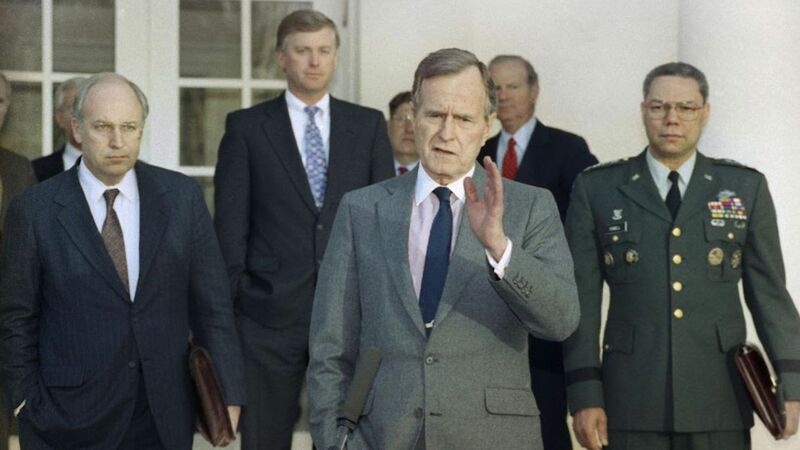 "With sound judgement, common sense, and unflappable leadership, President Bush guided our Nation, and the world, to a peaceful and victorious conclusion of the Cold War." "As President, he set the stage for the decades of prosperity that have followed. And through all that he accomplished, he remained humble, following the quiet call to service that gave him a clear sense of direction."